Steve Vaccaro is representing the parents of Mathieu Lefevre, a 30-year-old artist tragically killed by a truck driver while cycling in Williamsburg, in litigation against the NYPD to ensure a full and fair investigation of the crash. Read about the NYPD’s handling of the investigation into Mathieu’s death in the article by Jim Dwyer of the New York Times below, and watch Transportation Alternatives’ Noah Budnick speak about the NYPD and the Lefevre case on “Inside City Hall,” linked here. 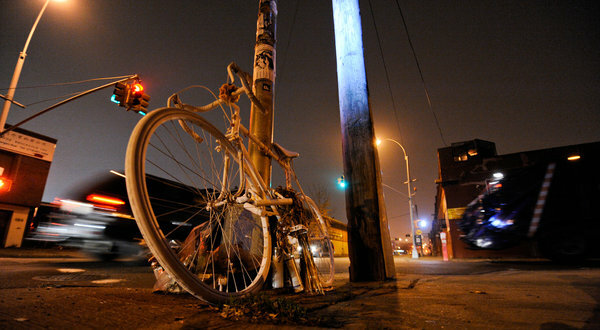 A so-called ghost bike stands in memory of Mathieu Lefevre, an artist from Canada who was killed on his bicycle in a crash in October. The Lefevres — mother, father and one of their surviving sons — took the first flight to New York, spent the night with a friend, and the next morning went directly to the city morgue on Winthrop Street in Brooklyn. The second of the Lefevre sons, Mathieu, 30, had been run over by a truck two days earlier, just after midnight on Oct. 19, while he was biking home to Williamsburg. The truck did not stop. The 90th Precinct station house proved to be a House of No, as Ms. Lefevre described it: the family was told at the desk that there was no detective available to speak with them, that Mr. Lefevre’s property was not there and that no report on the accident was available. “After some time elapsed, I called the detective at the morgue, who had given us her phone number in case we ran into problems,” Ms. Lefevre said. Eventually, a detective in the 90th Precinct explained that the person handling the investigation of their son’s death would not be back for several days. “The detective we saw said he had no access to the information, that they do not share files,” Ms. Lefevre said. After four hours, she said, they left. More people are killed in traffic accidents than by guns in New York City; death by motor vehicle is rarely treated as a crime. Someone died in city traffic every 29 hours, on average, from 2005 to 2009, according to a study by the city’s health and transportation departments. While New York has a stellar record compared with other big cities in the United States and has drastically improved in the last decade, the rate of traffic fatalities is far worse than in many major cities in Europe, according to another study, by the advocacy group Transportation Alternatives. As a boy growing up in Alberta, in the countryside of western Canada, Mathieu Lefevre staged turtle Olympics, skied, built forts, played hockey and soccer. Everyone in the family was an avid cyclist. In Montreal, where Mr. Lefevre studied art, his work was hailed as witty and caustic, and it won honors. Five days after their visit to the 90th Precinct station house, they heard from a detective. Meanwhile, they read articles that quoted anonymous police sources stating, variously, that Mr. Lefevre had run a red light near the scene of the accident, at Meserole Street and Morgan Avenue, or that he had been passing a truck on the right as the truck was turning, making him a casualty of a right hook. “I specifically asked about the red light, and the detective said there was no evidence of that,” Ms. Lefevre said. The authorities have said that the driver was not aware of striking Mr. Lefevre, although Steven Vaccaro, a lawyer hired by the Lefevres to get information, said that a diagram on the accident report showed that the truck hit the bicycle from behind. In any case, no charges have been filed. A week after visiting the station house, the Lefevres were given their son’s belongings. They had been in the station house all along.